Creeping Rungia is an annual herb, 10-30 cm tall. Slender stems are prostrate, rooting near the base, then they become erect. Oppositely arranged, short-stalked, oblong-lancelike leaves are 3-5 cm long. Stalkless flowers occur in an erect 1-sided spike, 3-7 cm long, at the end of the stems. Approximately elliptic, pointed, bracts are 6-8 mm long. Flowers are 2-lipped bluish purple, with dark purple and white spots. The oblong upper lip is 3 mm long, while the larger lower lip is 5 mm, shallowly 3-lobed. The flowers have two stamens. 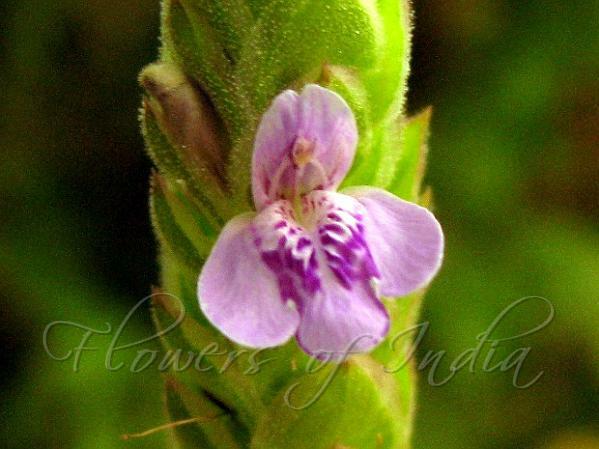 It is commonly found in the grasslands in the Western Ghats. Flowering: November. Identification credit: Ashish Nimkar Photographed in Maharashtra.